With the rise in popularity of the Google Chrome book, it makes sense that Google would build out a completely interconnected ecosystem. While G Suite is unavoidable on a Chrome Book, any Google Chrome user will benefit from the available tools. We’ll be looking at how to use G Suite for success. The main reason you want to use G Suite is that it simplifies the number of programs you need to use. 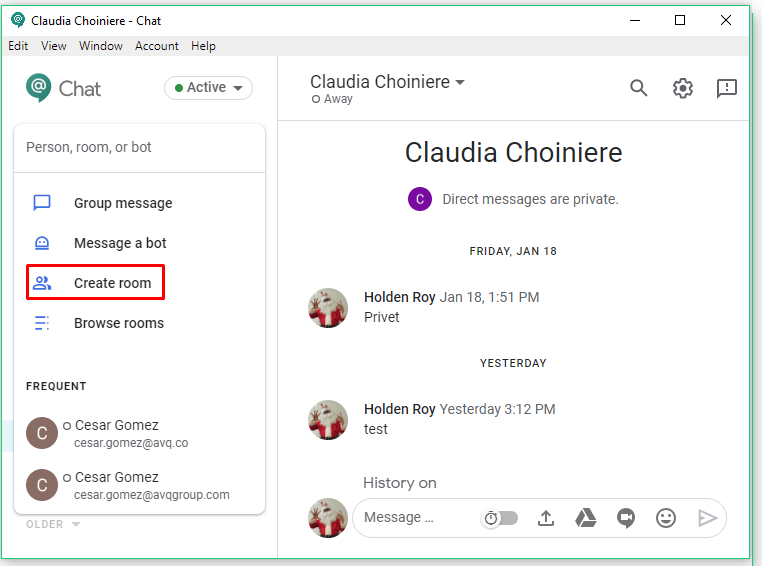 Instead of finding one app for chat, another for meetings and yet another for file storage, G Suite combines pretty much everything you need to synergize a workflow. Fancy jargon aside, let’s break down how to use G Suite for success no matter your position. Part 2: Separate Google Chromes for separate accounts. The mission is to centralize your life. 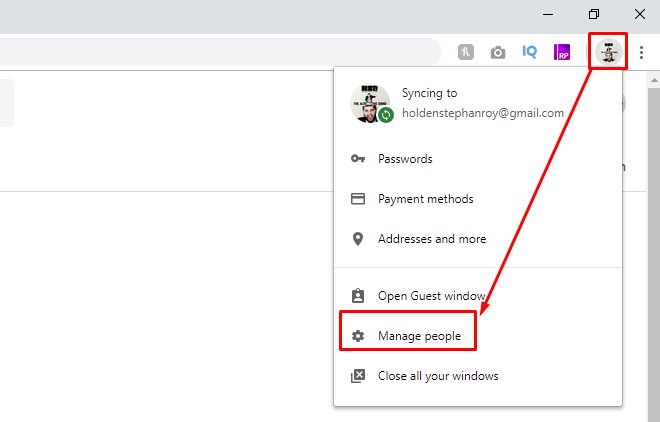 The first step in how to use G Suite for success is to make sure Google Chrome is connected to your Google account. This may be your own private account but is more likely being supplied to you by your company’s IT department. You’ll want to sign into Google Chrome with the account linked to G Suite. You will now see your account avatar appear over here, everything is now linked to Chrome. If you’re already signed into Google, the process is pretty similar. Your account will be added to Google Chrome. If you’re like me, the idea of switching back and forth all the time sounds less than ideal. But Google has a simpler way to handle this. 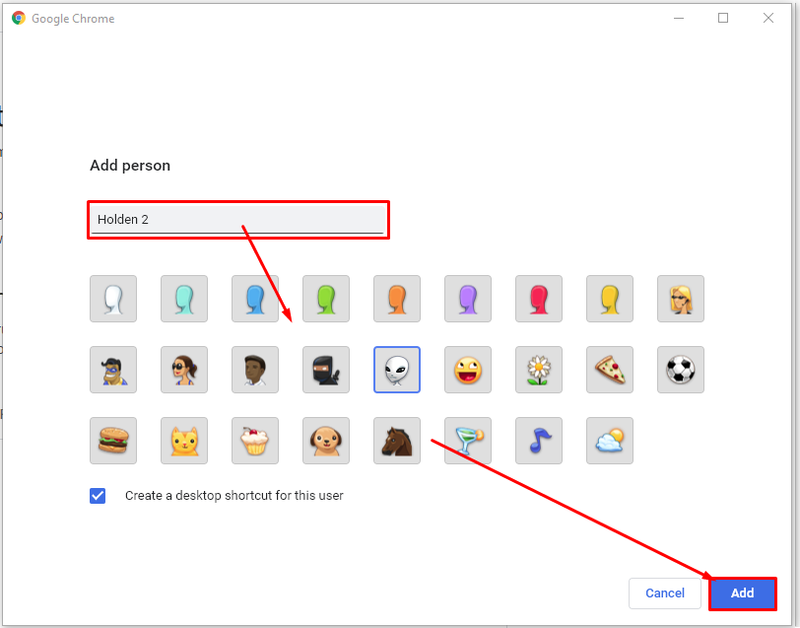 In your Google Chrome settings you can create separate user profiles. Click on your account icon at the top. Give your profile a name. You’ll see a new Google Chrome window open. Use your account credentials to sign in. You are now set to use separate google accounts in separate chrome instances easily identifiable by this icon on the task bar. 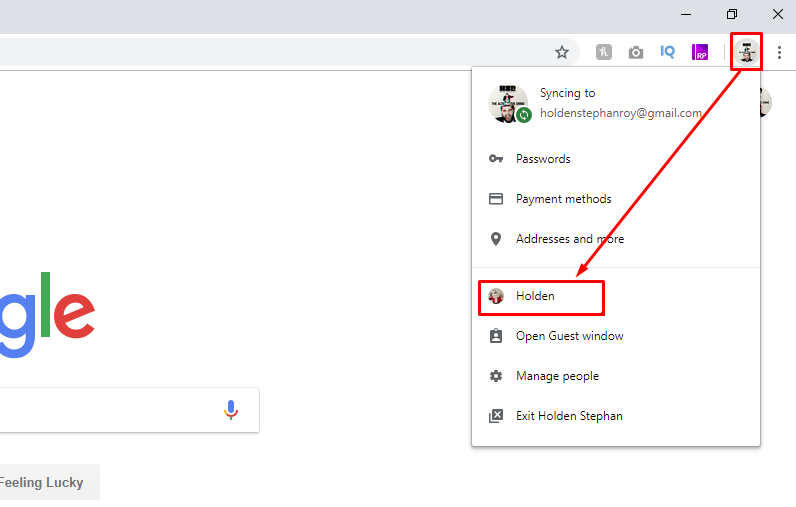 When you next open Chrome you can switch profiles quickly. You’ll see a Chrome window with that profile. 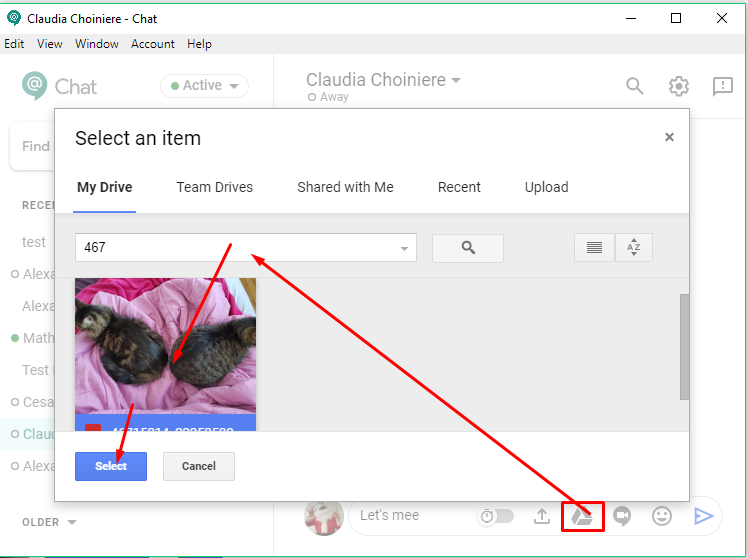 It’s pretty easy to download Hangout Chats. This is a crucial app when thinking of how to use G Suite for success. 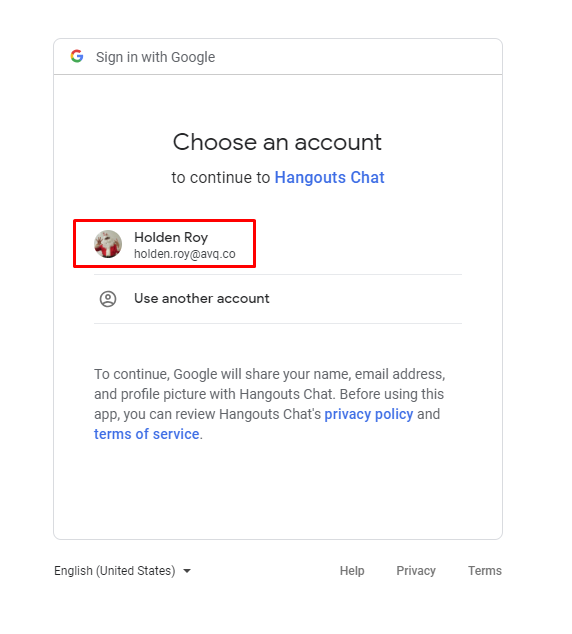 Click here while logged in with your G Suite account. The installation is quick and painless. When you launch the app you’ll need to sign in. 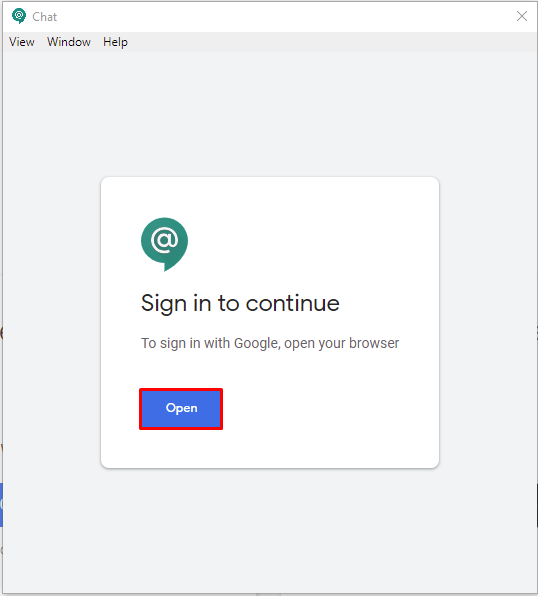 A web page will open showing your signed in Google Accounts. Choose your G Suite account. 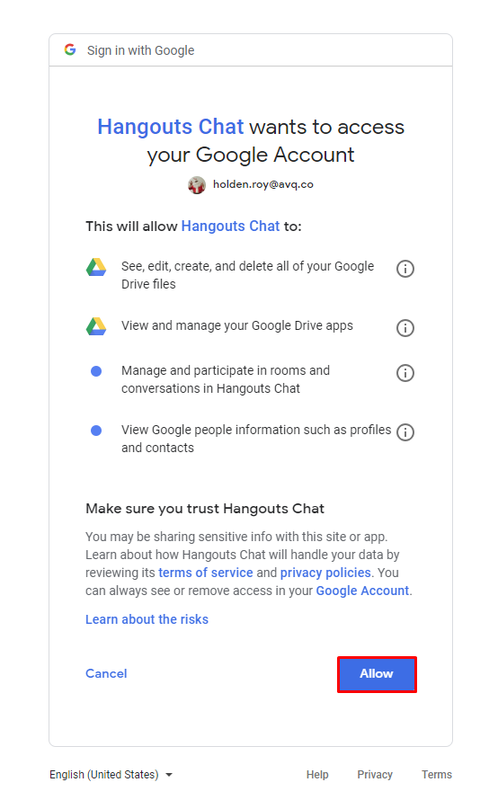 You may need to click allow to authorize Hangouts Chats to access this account, if so click allow. Click on their name to start a chat. You can also start a group chat. Click into the search bar. Search for each member and click on their name. They will appear at the top once selected. Click Message to start the group chat. The group chat will behave like any normal chat, only each member of the group can participate. This chat cannot be renamed. If you want to save the group chat you can pin it to the top. Click on the three dots and choose Star. If you do want an option with flexibility and custom names, you may want to think about Rooms. You can add people (or bots if relevant) to each room you create. Click Add People & Bots. As you type in their name, it will appear below. Click on the person and they will be added to the list at the top. Keep adding people until you are ready to continue. When you click send, each recipient will receive an email allowing them to join the room. 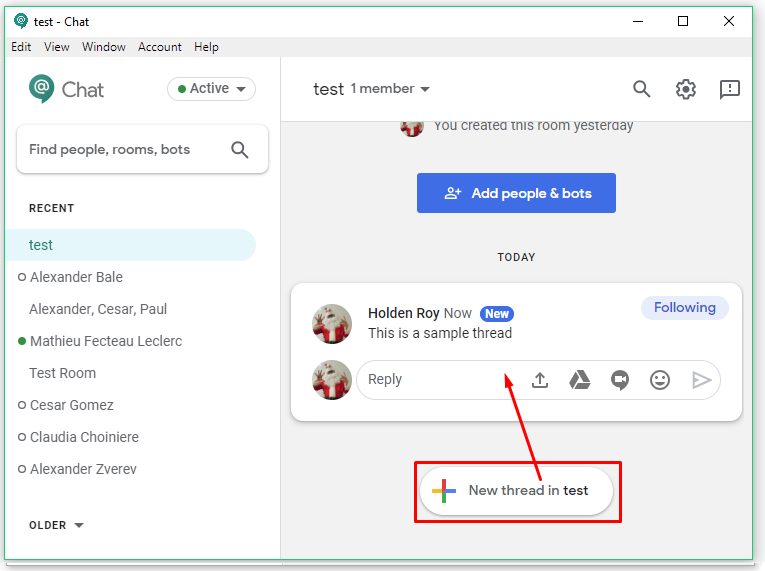 In the room you can create threads. Each thread is its own chat that anyone can contribute too. 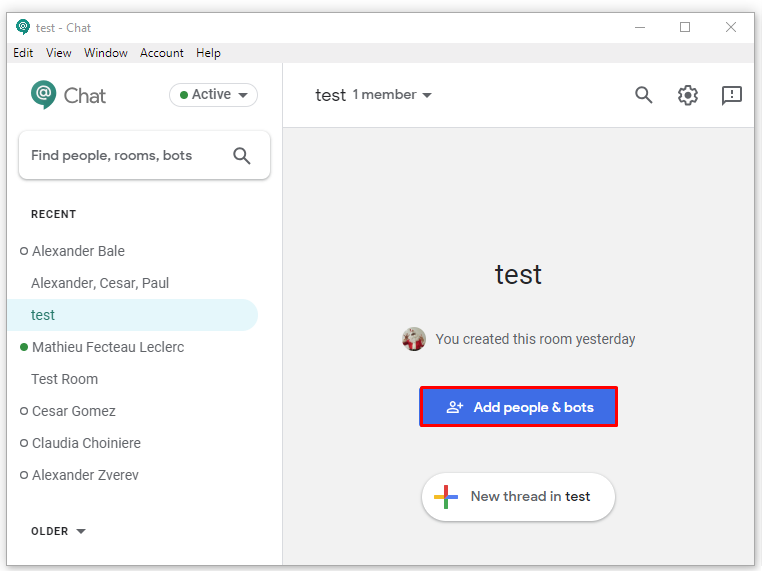 At the bottom of the room you’ll see New Thread in Test Room, clicking there will create a new thread. Treat this like a new forum thread where your first message sets the tone for the rest of the thread. Anyone can then come and answer your questions by replying directly to it. 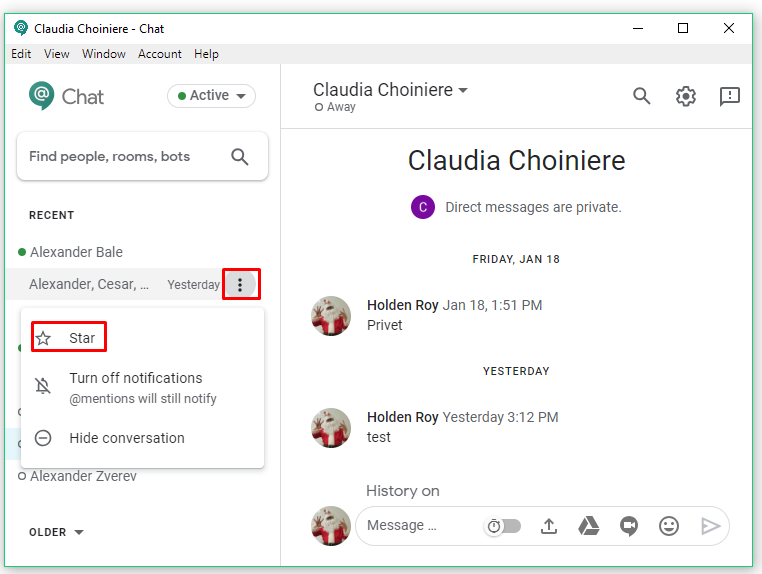 Another app you’ll want to use is Hangouts Meet. This will host meetings in a Chrome browser that everyone can easily join. There are a few ways you can set up a meeting. 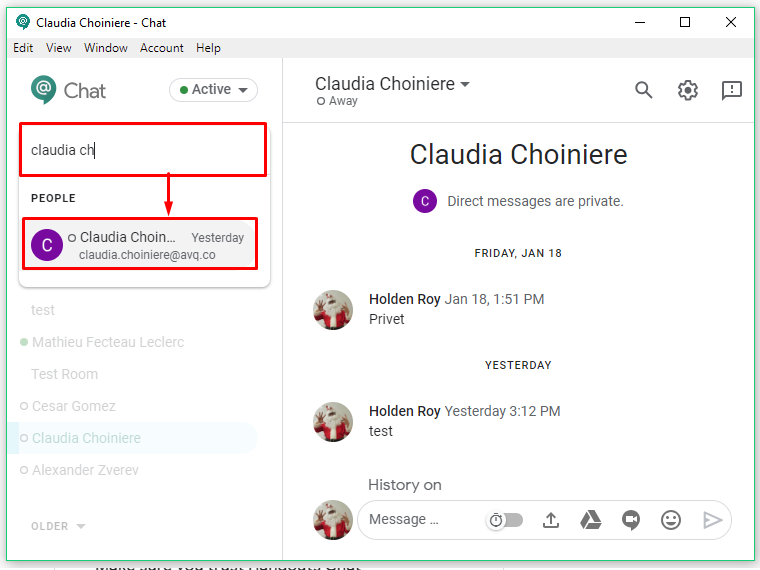 The easiest is using the Hangouts Meeting plugin for Outlook. Click here for more details on installing it. 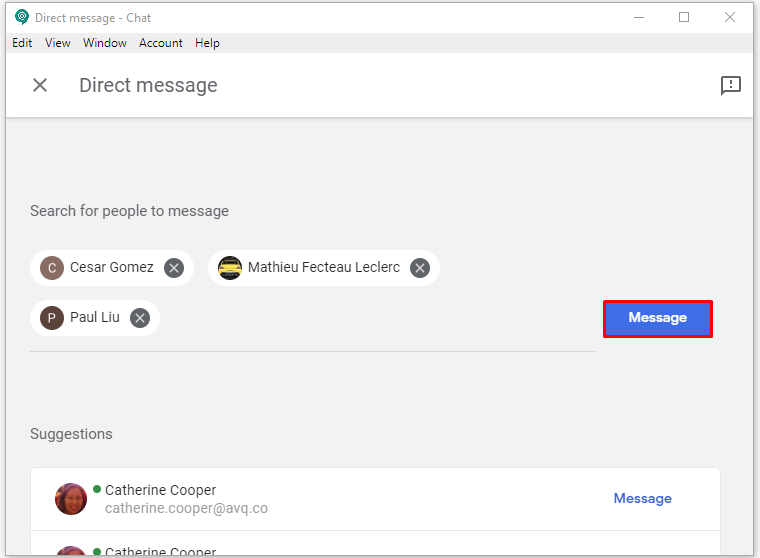 When go to create a meeting in outlook you’ll see the Hangouts Meet plugin here. You may need to sign in, enter your G Suite credentials and continue. Once you are signed in, the meeting link will simply appear in the meeting invite. 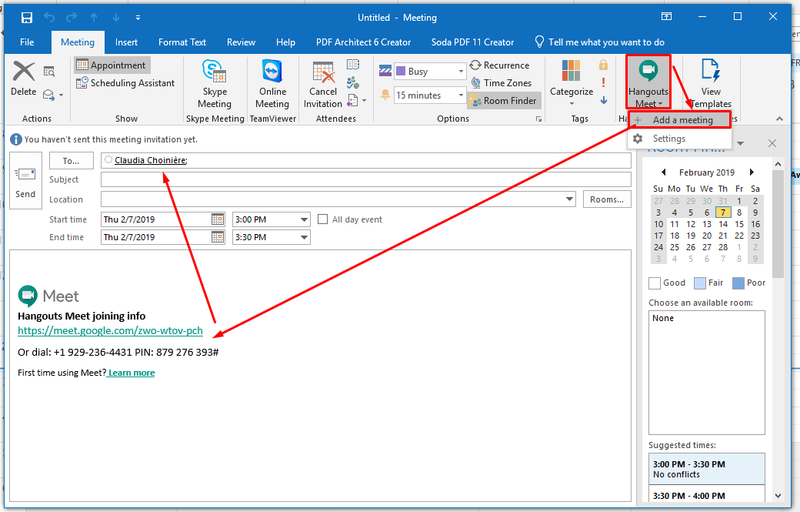 Add the emails of your meeting participants in the “To” field. Each person will receive the meeting invite via outlook. 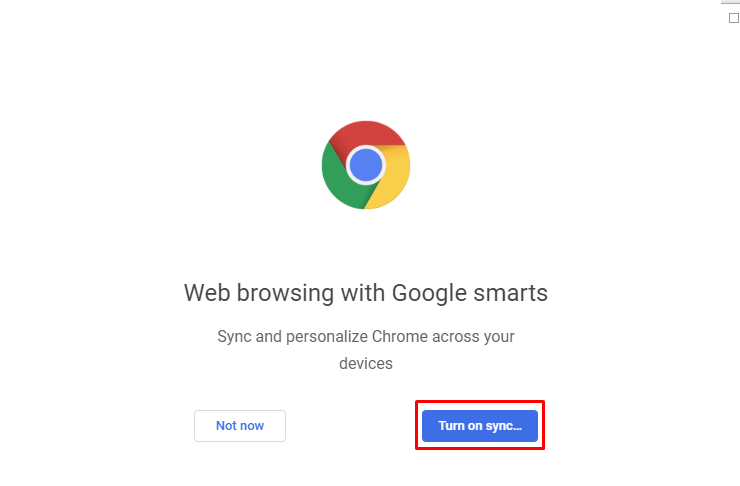 When you click the link a Google Chrome window will open. You’ll have a chance to adjust your mic and webcam settings. If you see a popup requesting access to your mic and camera, click Allow. 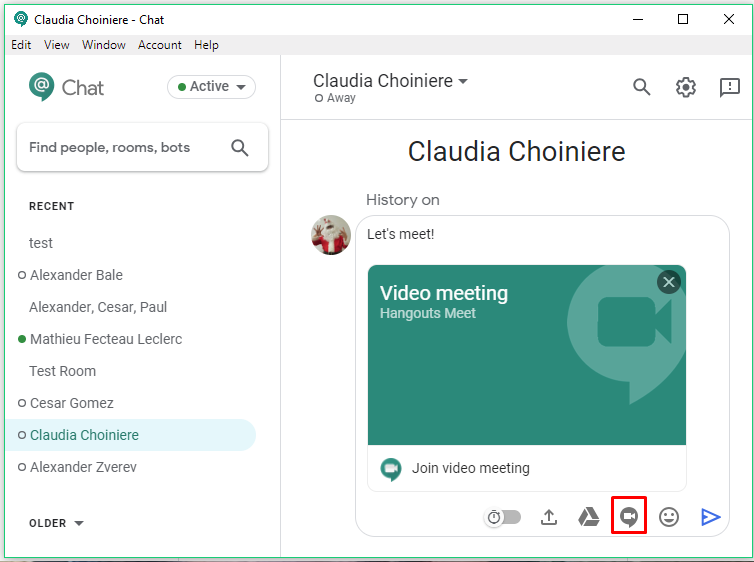 Then when you click Join Meeting, it will start the meeting. You can easily switch to presenting a screen. Choose either a window or the screen. Pick the screen you want to share and voila. While in the meeting you can also chat. 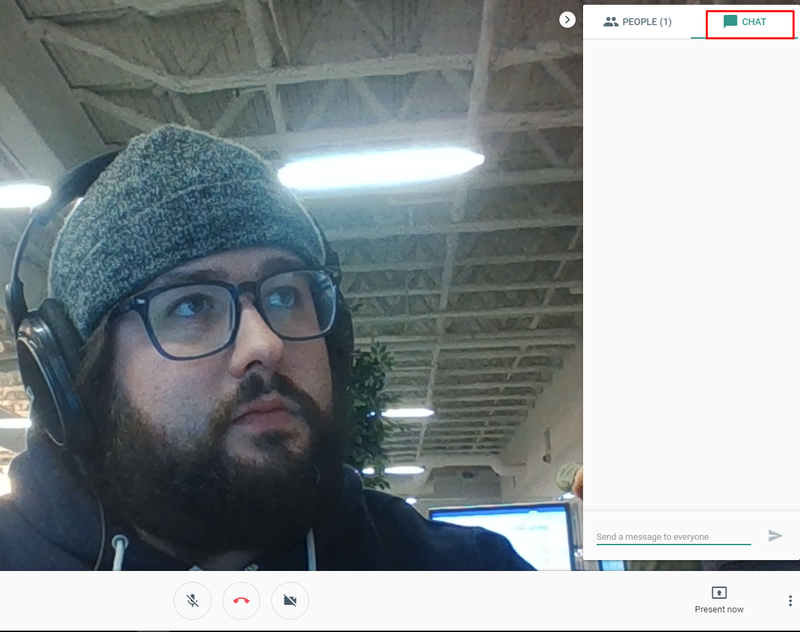 You can also create a meeting link directly in Hangout Chats. Click the enter key and your meeting invite will send. You’ll see this option available in rooms as well as group chats. The final part to a good meeting is getting what’s on your laptop onto one of the TVs in a meeting room. Considering our goal is how to use G Suite for success, this is an imperative step. Full disclosure, this section only applies to environments where casting makes sense. 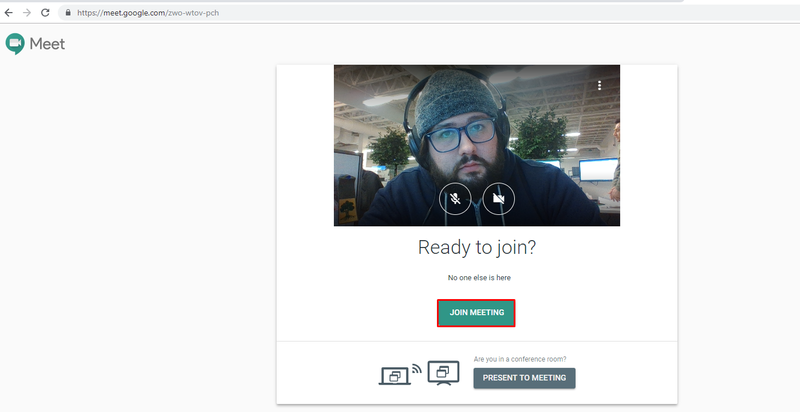 Your meeting opens in Google Chrome. You can cast what’s on your screen directly from this window. You’ll see a list of all the meeting rooms. Click on the one you are in, and you will be connected. When you are finished casting, remember to turn it off. Click again to stop casting. 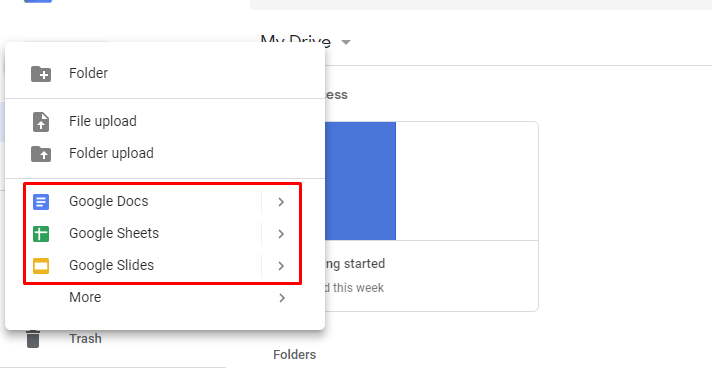 The last tool we’ll be using from Google is Google Drive. 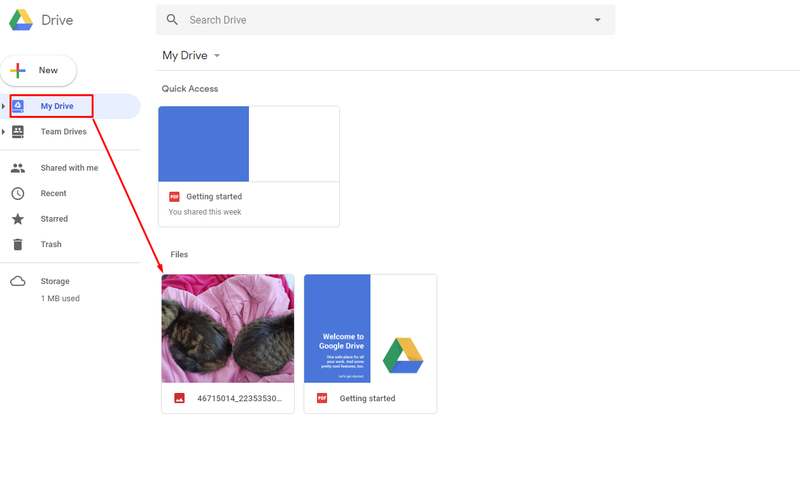 Google Drive is a virtual storage system built to collaborate with others. This is another key element when thinking of how to use G Suite for success. In My Drive you can store files. You can upload existing files. Drag and drop any file or folder onto the drive. Browse your computer and choose the files. Once uploaded they will appear in your drive. You can make new folders in your drive. Then you can just drag and drop files into it. Double click to the folder to open it. Any files you upload while this folder is open will come right here. You can also create a sharable google doc, sheet or slide by clicking on the file type you want. This will be added to whichever folder you have open. 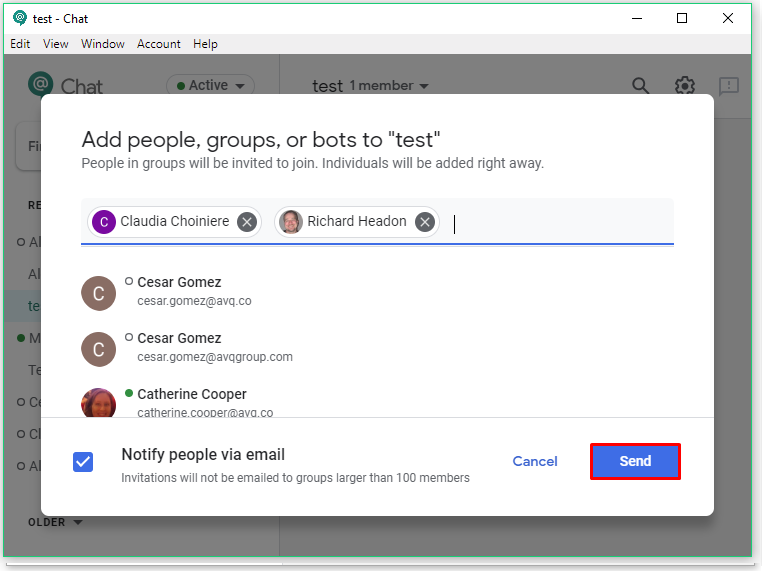 You can also use the Team Drives feature to create group drives for collaborative efforts. First, you’ll want to create the drive. Then the drive will appear. 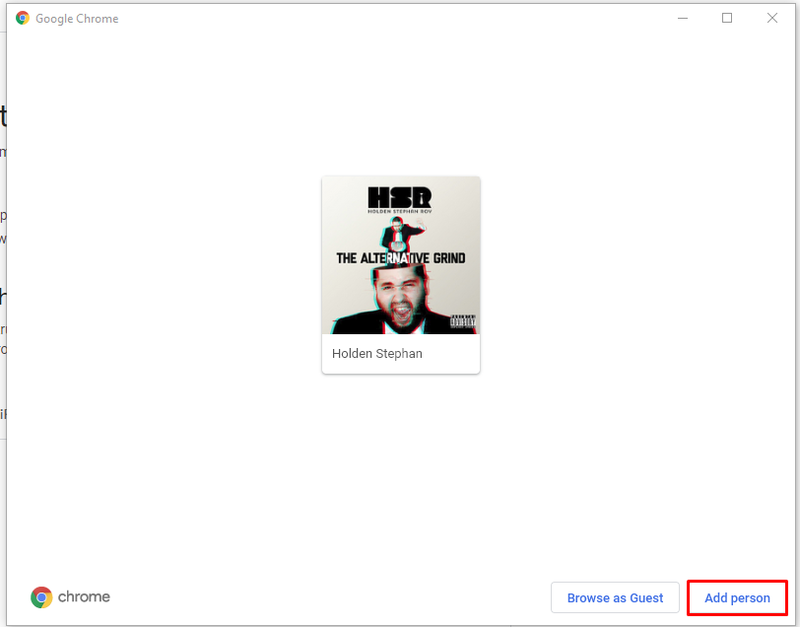 You can right click on that drive to add members. You can add a brief message describing the drive. Each person will receive the link to gain access to the drive. 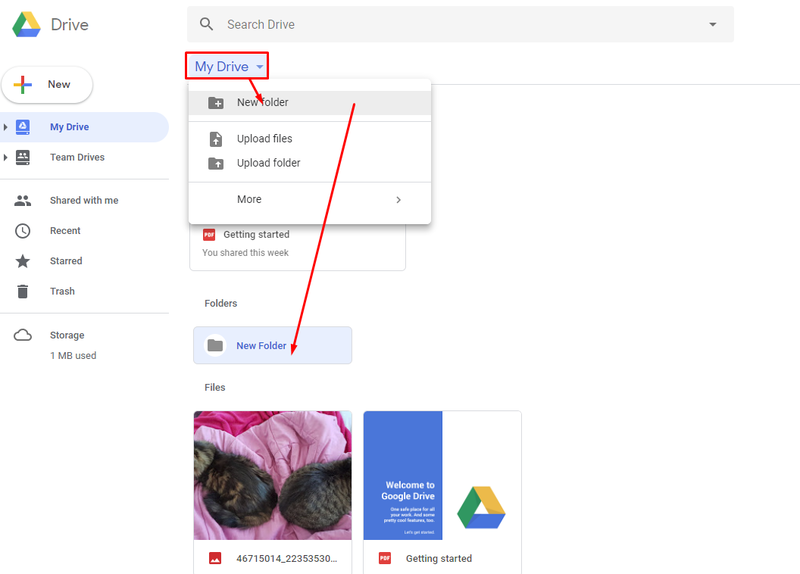 Since all your files are stored centrally in Google Drive, can now share that file with anybody. Collaboration is a key part of how to use G Suite for success. 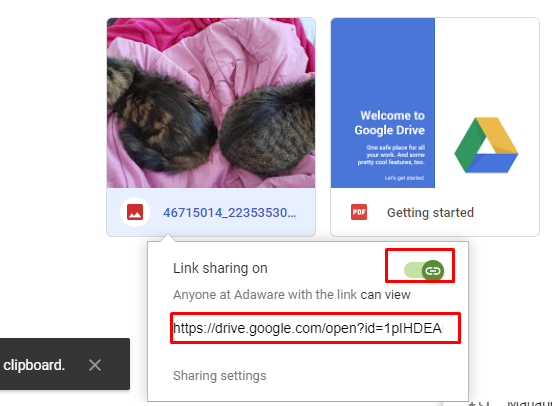 You may need to turn on Link Sharing. Once you do this file will now have a link. You can send it to anyone and they can access it directly. 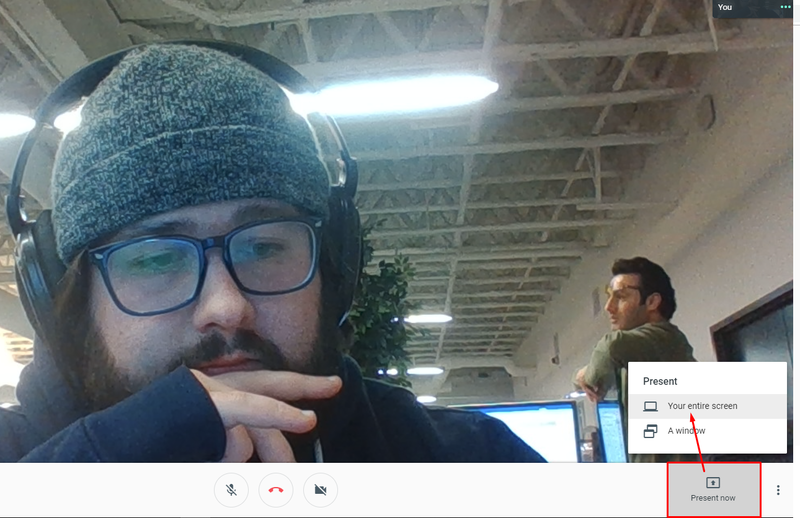 You can also send people files directly in Hangout Chats. 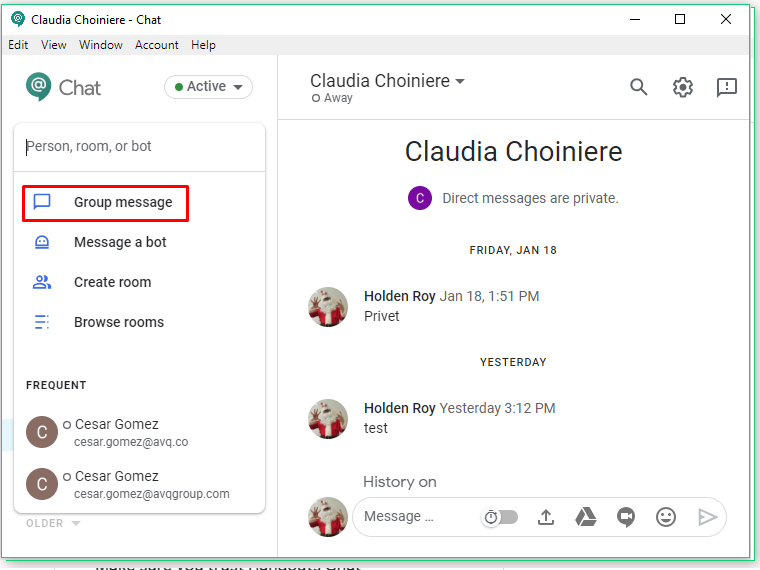 While this article has been about how to use G Suite for success, another tool that compliments this system is Soda PDF. 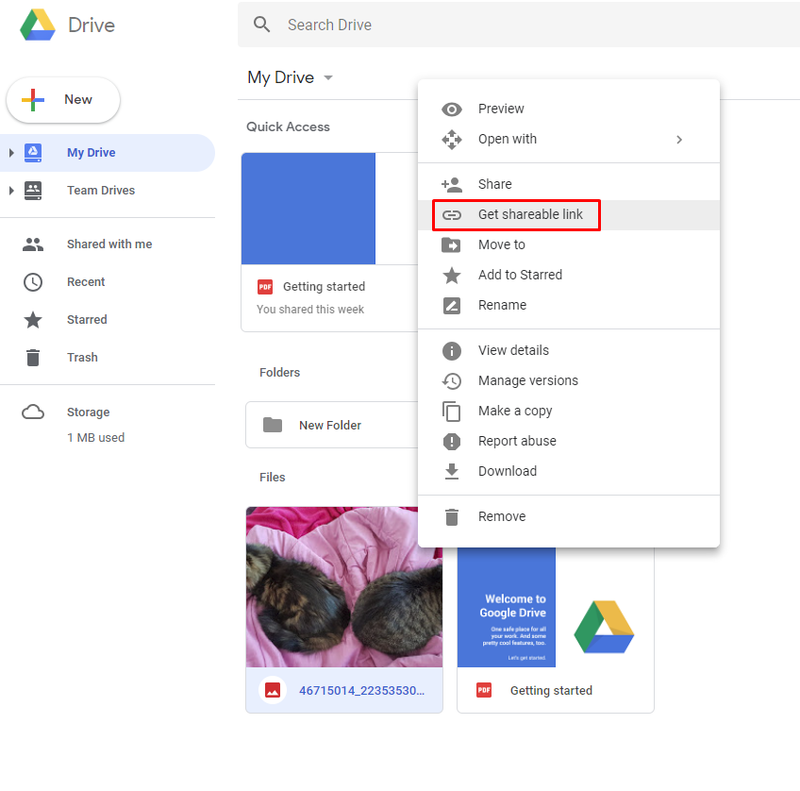 Using Soda PDF you can open any files stored in Google Drive, even if they aren’t in the PDF format (those files will be converted). You can also save your PDFs directly to Google Drive, making them accessible in your G Suite ecosystem. We hope this article helped described how to use G Suite for success. Feel free to download Soda PDF and give it a try.